We are SO excited to start 2015 with all of you at CrossFit North Charleston! Read on for some exciting announcements about our Kickstart Challenge, new personal training, and January Member of the Month, Marika Kary! Kickstart Challenge: There will be info sessions on January 8 at 6:30, or January 10 at 8:30 or 11:30. Whether you want to lose weight, gain muscle, or improve performance we will have an option for you! See Craig or Cara starting TOMORROW to sign up! Personal Training: We are excited to announce we will begin offering personal training in 2015 at CFNC. Coach Jenna Torres will lead our personal training program and offer sessions tailored to fit your personal goals. Contact us for pricing and more information. January Athlete of the Month: Congratulations to Marika Kary, you are our January athlete of the month! Thank you for bringing your positivity, determination, and drive everyday to the gym! What makes you, you? I suspect it’s my interest in people around me and eagerness to chat them up – We were in Ireland two years ago and we met a guy at a pub who had my dream job… he is from Australia and spends his time driving around the country collecting people’s oral histories for the National Library. That would be so neat. I also have a super serious side – so under all that happy, bubbly stuff, is a ridiculously competitive and focused person. And I’m honest. Very direct and honest. Describe your experience at CFNC. I have really enjoyed CFNC, it’s a great mix of impressively strong athletes – that we will all gladly cheer on at the Games; some very determined newbies whose grit and determination can whip you in line on your lazy days; and then us in the middle of the pack who keep showing up because it’s fun, it’s effective and we are going to catch those stronger athletes. I also like the coaching, they are incredibly effective at correcting and giving cues to athletes, are good at pushing you when you need to be pushed and telling you to dial it back when you are about to get stupid. What has been your favorite CrossFit moment thus far? I hate to admit it, but I love it when everyone is just goofing off and yapping. Every member has had a workout that has humbled them or made them feel like a rockstar, and watching people go through that allows everyone to be pretty comfortable with each other, so the conversations around the room are pretty entertaining. What are three of your current CrossFit goals? 2) Muscle ups (yeah I got my first two at once, but I have shied away from trying again, so maybe consecutive muscle ups? )… And butterfly pull-ups! What is your favorite WOD? I really like Angie for its simplicity (all body weight stuff) and ability to kick your tail. What is your favorite “cheat” meal? Double stuff Oreos and milk. What do you hope to achieve through CrossFit? A previous coach put it well when he said crossfit will help me be able to get up and down from a chair in my eighties. That matters to me. But…it would also be super exciting to qualify for Masters. I have lots of work to do to get there and know that the journey to get there will put me light years ahead of where I am now… Plus, they have Masters categories all the way up to 60+ years, so it’s a goal I can work on for a nice long time. 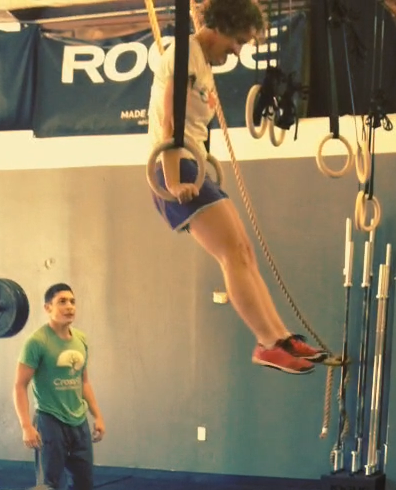 What is the most challenging aspect of CrossFit? Patience. It is incredibly hard to accept you will not get everything in one day… or the first 100 times. Share a favorite recipe! This is for Susan… chipotle sweet potato salad with bacon! Peel and cut the sweet potatoes into cubes (about ½ – 1”). Toss with the 2 tbsp of olive oil, sea salt, and pepper. Spread out on a baking sheet and cook at 400 degrees Fahrenheit for about 20 minutes (or until soft). Cook the bacon (crispiness to your liking). And break into pieces (or cut if you like it soft). And chop the parsley and green onion (scallion). When the potatoes are done, mix all ingredients together. If you like warm potato salad, then serve it immediately. If you like it cold, then put it in the refrigerator and let it chill.